Scientists at Karolinska Institutet, Sweden, in collaboration with researchers at University of Oslo, Norway, have demonstrated the most accurate distance between densely packed antigens in order to get the strongest bond to antibodies in the immune system. The study, which is published in the journal Nature Nanotechnology, may be of significance to the development of vaccines and immunotherapy used in cancer. Today, many new vaccines make use of something called "particle display," which means that the antigens are introduced into the body and presented to the immune system in the form of particles with lots of antigens densely packed on the surface. In some cases, particle display of antigens works better as a vaccine than simply providing free antigens; one example is the HPV vaccine, which protects against cervical cancer. Antibodies, or immunoglobulins, perhaps the most important part of the body's defence against infection, bind antigens very effectively. The antibodies have a Y-shaped structure whereby each "arm" can bind an antigen. In this way, each antibody molecule can usually bind two antigen molecules. "We have for the first time been able to accurately measure the distances between antigens that result in the best simultaneous binding of both arms of different antibodies. Distances of approximately 16 nanometres provide the strongest bond," says Björn Högberg, professor at the Department of Medical Biochemistry and Biophysics, Karolinska Institutet, who led the study. 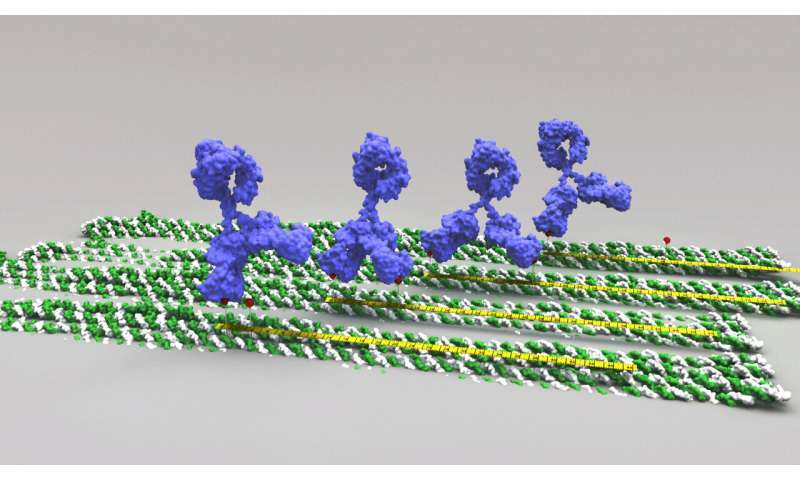 "By putting antigens on these DNA origami structures, we can manufacture surfaces with precise distances between the antigens and then measure how different types of antibodies bind to them. Now we can measure exactly how antibodies interact with several antigens in a manner that was previously impossible," says Björn Högberg.